That's super! Best practice: What can we learn from Supercell’s success? Gaming company Supercell’s net worth went from zero to three billion dollars in three years. Juhani Mykkänen learns the seven rules to Supercell-like success. Let us do a little thought experiment. You and a few friends get together to set up a company. You hire the best talent you can find. Your employees give it their all, but your first product is a total flop. Y ou feel sorry for yourselves for a brief moment but promptly pull yourselves together. You decide to abandon that first failed idea and focus on the next ones. Fast forward a year. Something happens. You create two products that turn out to be massive hits. Your company starts making money faster than Facebook on its best days. Your company now employs 100 people. Each one of them is making you millions of euros a year. Obviously you’ve done something right. But what? This little thought experiment is actually the nutshell version of the story of Finnish gaming company, Supercell. Supercell makes mobile games for tablets. Its CEO Ilkka Paananen founded the company with five friends in the summer of 2010. Supercell’s first product, a game called Gunshine, was a total flop. The two games the company launched in 2012 were not. Last spring, for example, those games, Hay Day and Clash of Clans, had 8.5 million daily players generating $2.4 million a day. And in October of 2013, Supercell and two Japanese companies, GungHo Online Entertainment and SoftBank, made a big announcement: the Asian companies had agreed to buy a 51 per cent stake in Supercell. The deal was done at $1.5 billion. But the true extent of Supercell’s meteoric rise became clear when the company announced its 2013 earnings last February. At the tender age of three, Supercell ranked in €672 million. And €349 million of that was profit. When you delve deeper into how a story like this can possibly be true, it becomes clear that every company and leader on the planet can learn at least seven things from Supercell’s success. Ask people what Supercell’s secret is and they’ll tell you that it’s so successful because its founding partners had practiced at two other companies before launching this one. Supercell’s CEO Ilkka Paananen has 13 years of experience in the mobile gaming industry. That’s a long time considering it hasn’t even been seven years since Apple introduced the first iPhone. Paananen launched his first mobile gaming company, Sumea, in 2000. It did well enough that it was snapped up by the global game developer Digital Chocolate in 2004. At Digital Chocolate, Paananen found a mentor in Electronic Arts founder and American gaming guru Trip Hawkins. Paananen himself has said that the time he spent at Digital Chocolate felt like he was getting his ”gaming MBA”. ”It’s going to sound really naive and simple, but the single biggest lesson that Mikko [Kodisoja, Supercell co-founder and creative director] and I have learned is that if you really want to build the next generation of games company, it’s actually all about the people”. There’s a reason why Supercell is called Supercell. It was founded by six men: Ilkka Paananen, Mikko Kodisoja, Niko Derome, Lassi Leppinen, Visa Forsten and Petri Styrman. Their philosophy was that games shouldn’t be made by teams of dozens or hundreds of people. They should be made by small commando teams of half a dozen developers with unlimited freedom – supercells. Or, as it says in Supercell’s company values: ”The freedom to make quick decisions and take risks.” ”A lot has happened over the years, but it’s still that original idea – that massive shift in thinking that allows them to soar”, says Miki Kuusi, the main organizer of Slush, one of Europe’s biggest startup-events. For example Clash of Clans – which has made millions and been the top-grossing iPad game in 122 countries – was developed by a team of five guys in six months. So what do these super-teams actually do? The first step is finding the best people, an idea rooted in the fact that Supercell’s six founding partners were all top talents. ”It’s really hard to entice the best talent with money or shares”, says Wili Miettinen. Once the team is assembled, Supercell lets its members – led by a team leader –prioritize their own time. When someone comes up with a good enough idea, the team pitches it to the CEO. Then the testing and development starts. Supercell makes free-to-play games. The idea behind free-to-play games is that they’re free to download, but players can pay to progress faster. That means you can pay to play and progress more in the same amount of time. In Hay Day, for example, a player runs his or her own farm. Obviously you’re going to want to feed your chickens so they’ll start laying eggs. That takes time. You might have to wait half an hour or so for your chickens to lay eggs. Or, you could pay a few euros for a handful of diamonds which you can then use to get your chickens to lay their eggs on command. And if you haven’t before, you’ll definitely reach for your wallet once you realize there’s no more room in your storage shed and the game tells you it will take four hours to build one – unless you pay. Now back to the team. After the team gets an idea for a game and they’ve gotten the green light from the boss, the testing and development phase starts. A small team creates a prototype that Supercell employees play internally. With Clash of Clans, for example, Supercell realized it probably had a hit on its hands after a weekend-long internal gaming session. ”I made a score card with zero to five stars on it and asked everyone to fill it out anonymously”, the game’s development team leader Lasse Louhento told the newspaper Helsingin Sanomat. Continuous testing is extremely important, be- cause – as Miki Kuusi explains – no one can really claim to have ”years of experience” with developing free-to-play games. That’s why Super- cell’s autonomous teams have set out to become the best in the world. And they’ve done it through trial and error – by succeeding and failing. And that brings us to the next lesson. In the thought experiment we started with, we imagined being founders of a company whose debut product was a flop. For Supercell, that debut product was Gunshine, a real-time multiplayer game developed to be played on Facebook. Many who have followed Supercell’s rise to superstardom have said it was this moment of failure and the company’s ability to overcome it – that was like a litmus test for its entire future. It’s 2010–2011. Gaming industry startups are fo- cused mainly on developing games for Facebook. The market is dominated by a company called Zynga and Supercell wants in on the action. Facebook’s user base is growing exponentially and Supercell believes it can successfully reach hundreds of millions of users. ”Supercell simplified its idea into one beautiful slide”, Miki Kuusi says. According to Kuusi, Supercell decided to capitalise on the fact that Facebook had harnessed a massive number of users but almost no one was offering them challenging, high-quality games. ”What if we made real games for Facebook?” they thought at Supercell. And that became the company’s main strategy. But they hit a bump in the road. Gunshine was a good online role-playing game – Supercell wouldn’t even know how to make anything less. But it wasn’t what Facebook users were used to. The game got good reviews for its technical merits. But Facebook users were used to simple and easy-to-play games, not games like Gunshine, where you’re part of a resistance movement fight- ing against the corporate elite amongst an army of zombies. They had pinned all their hopes on this game. They had used it to collect millions in seed capital. And when the moment of truth finally arrived, it fell as flat as a pancake. So what do the folks at Supercell do next? They reflect, weigh their options and hold an emergency meeting. Let’s dump everything we’ve done up until now. We’ve got a new strategy in mind. Zynga published its earnings right around the time Gunshine launched. The numbers weren’t particularly impressive. Paananen and the rest of the management realized that Facebook wasn’t necessarily the rainbow that would lead them to millions of players and that pot of gold. But the year before, in the spring of 2010,Apple had released the iPad. It sold 15 million units in less than a year. Supercell had developed a set of tools they could have used to create all sorts of games for Facebook. Now it looked like all that work had been done in vain, too. The team came to a decision. They went to the board with a two-word strategy: tablet first. It was one of the best business decisions made on the planet that year. ”They decided to focus on mobile and tablets right when the free-to-play sector was headed for a massive hockey stick growth spurt”, serial entrepreneur Wili Miettinen says. ”The majority of games aren’t original ideas, they’re variations of existing games. That’s why timing is more important than almost anything else”, Miettinen explains. What he means is that Hay Day and Clash of Clans are great games, but they’re both ”just” much better versions of existing concepts. That’s the norm in the gaming industry – com- panies try to remake existing games by improving some of the features or adding new ones. But every once in a while someone creates a new and improved gaming experience at exactly the right moment. ”For example, if Angry Birds had hit the market a year later, I’m not sure the games would have even made the top 100 list. But they launched right when touchscreens were becoming hugely popular and people were looking for things to do on them”, Wili Miettinen says. No one has a crystal ball, Miettinen says. But you know you’ve really succeeded when you’re playing in the big league and you get the timing just right. Even Petri Järvilehto, the founder of the gaming company Seriously and former Executive Vice President at Rovio, which is home to the Angry Birds, smiles when talking about Supercell’s decision to start making tablet games. They got off to a rough start, but now Paananen and Supercell hold all the keys to success. They’ve got talented teams with unlimited freedom. Their focus is now firmly on tablet games. And the company’s coolheaded CEO has the trust of both investors and the board – just as long as the next games make money, too. In theory we know how free-to-play games make money – by giving the player the chance to pay to play more. But anyone can give players the chance to pay to advance more quickly. The question is: How do you make a free-to-play game that makes millions of dollars a year? ”I can explain gaming company logic to you”, says a man sitting at a table in a Helsinki restaurant. The man is a twentysomething analyst who used to work in the gaming industry. He’s agreed to explain how it all works. He doesn’t want to talk to us as a representative of the company he works for now, so our teacher will remain anonymous. The man takes out a piece of paper and starts writing down words. The second is called the retention rate, which measures what percentage of players return to a game after one day, 10 days or 30 days. He explains that in the world of mobile games, organic growth means that games spread via word of mouth. It gets good reviews and makes it to the top download lists or spreads from one friend to another, and so on. Non-organic growth, on the other hand, is when users are bought, for example by luring new players in with paid advertisements on other games or apps. And this brings us to the heart of the matter. The average amount of money put into the game by each individual player has to be greater than the average cost of ”buying” one player with paid ads. If you can achieve that, you’ve literally got a money-making machine on your hands. Your game is so good that each player brings in an average of $1.00.At the same time, you can pay $500,000 for an ad campaign that you can be pretty sure will bring in around one million new users. In this scenario you’ll double the money you invested in your money-making machine. Be- cause it’s more than likely that the $500,000 you invest in marketing will bring in a million new players, you’ll get a return of $1.00 on every $.0.50 you put in. This is why metrics are so important. If the av- erage revenue per unit is high, if players keep coming back to the game, and if, on average, each player brings new players to the game, then one player’s lifetime value quickly surpasses the cost of attracting that player. Our analyst takes Boom Beach as an example. It’s the new game Supercell launched this spring. As this issue of Aalto Leaders’ Insight went to press it was too early to predict the game’s success, but the beta version alone went straight to the top ten lists in Canada and Australia. ”You can test out the game in Canada and buy 10,000 test players in that market. Then you just track the metrics,” he explains. Canada is a good test market because we know from experience that success there is an excellent indication of how the game will do globally. Once the data starts rolling in, the company continues developing and tweaking the game un- til they get the metrics right. For example, if a new player doesn’t play the tutorial in the begin- ning of the game all the way through to the end, the team goes back and makes it clearer and more engaging. If, on the other hand, the ARPU is too low or the game’s ”monetization is too low”, as the analyst says, there isn’t enough incentive for players to pay to advance more quickly. The problem can easily be remedied by tweaking the in-game charges. For example, you can lower the price of the diamonds used to make your chickens lay eggs faster. Retention, on the other hand, indicates whether a game is addictive enough to keep players playing. 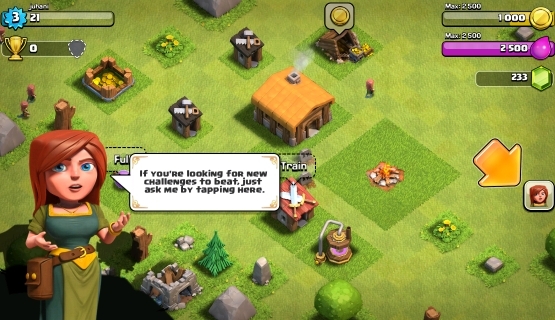 For example Clash of Clans play can be boosted with on-screen push messages reminding the player that his or her “clan needs a leader”. And the K-factor can be improved by doing things like giving players the diamonds they need to advance faster when they like the game on Facebook. That ”like” shows up in the player’s friend’s newsfeed, which then leads at least some of them to the game. Supercell hasn’t released its numbers, but based on the company’s turnover and profit margin, it’s clear they have a well-oiled money-making ma- chine on their hands. ”If they have a few hundred million, they only have to put a few million of that back into the organisation”, our analyst says. ”The rest is spent on user acquisition.” They put 50 cents in and take a dollar out. Like any aspiring growth company, Supercell needed investors at the beginning. One of the biggest challenges in wooing investors is that the gaming industry is massively hit-driven. When a company like Google develops its products it essentially gets better at what it does every day. It gains better insight into its business and customers, which to investors looks like they’ve built value. Investors love stuff like that. And what investors don’t love is when a company has a hit product that’s making them money today, but that no one will remember tomorrow. Especially if there’s no new hit on the horizon. A company like that isn’t a reliable or a sustain- able investment. Of course Supercell is a gaming company. Yet it still managed to raise $15 million in seed capital between 2010–2011 (including from Petteri Koponen’s Finnish Lifeline Ventures and London Venture Partners) and to sell 16.7 per cent of its stock in 2013 to investors for €100 million (buyers included Geneva-based Index Ventures and Lon- don-based Atomico). When you read what Supercell investors have to say in interviews and blog posts, one thing keeps coming up: Supercell – and most importantly Ilkka Paananen – managed to convince investors that the company had an exceptionally clear vision and a talented team to turn that vision into reality. ”When you apply for funding from venture capital companies like Accel, Atomico et cetera... If you walk in and announce that you plan to make €700 million within the first two or three years, they’re going to think you’re either insane or totally unrealistic. The only way to get people to invest in your company is by showing them you have a team that’s going to be able to handle anything the future might throw at you.” In other words, you have to reach a point where single hits and misses aren’t everything because you’ve got a company that is ready and able suc- ceed in the long term. ”We met with the Supercell team twice. We have a set of criteria that has to be met before we’ll invest in a company. First, we look at the team’s integrity. Are they telling us the truth? If they don’t know the answer to something, they have to be honest about it. Are there lots of unknowns when it comes to the industry and potential customers? Is the team good at learning new things? I really believe that company culture plays a huge role in creating the best end products and long-term development. Is working together going to be fun and productive? Is the team prepared to listen to our ad- vice? We’re looking to invest in companies made up of people who want to build a company – not just a product or a game. Do they have a comprehensive vision in mind or just an idea for a product? So what was it about Supercell that convinced us they met all of our criteria? First of all, they were down to earth. They were humble yet outgoing. They were polite. They were working hard to develop their tools and their whole production environment. They already had Gunshine, but they were focused on building up their company and portfolio. That showed us that they wanted to be more than a one-hit wonder. They wanted to build a company and a team. They were interested in what we said. And they were generally attentive. We met with Ilkka Paananen and Mikko Kodisoja in London first, then we met 8–10 other people in Helsinki. That gave us a good feel for the team. We had a lot of experience in the gaming industry and we’d seen first hand how massive teams wasted millions. Today, you have to have different ways of looking at risk: let a project fail and learn from it. Supercell was prepared to do just that. If something isn’t working they acknowledge that failure and move on. What we saw in Supercell was an organised team of professional businesspeople, not a group of people who were just looking to try something new. And that’s surprisingly rare in the gaming industry. We also had faith in their ability to make great games. They had tried mobile and Facebook. This wasn’t their first show. And that’s exactly what happened. First through user-generated revenue and eventually through an amazing partial exit. Instead of listing the company publicly, Supercell sold half of the company to a Japanese mega-company looking to enter the Western market. The price tag was $1.5 billion. And this brings us to one of the most important parts of Supercell’s story. It has to do with the foundation upon which the company was built once the money started coming in. In an article published in Pandodaily, a web magazine that focuses on the tech sector and startups, investor Kevin Comolli said that Supercell is Accel Partners’ fastest growing company in terms of turnover and profit. Keep in mind that Accel has been around for 33 years and has invested in companies like Face- book, Groupon, Spotify and Rovio. That’s a pretty good indicator of just how extraordinary Supercell’s success has been. So what have they done with all that money? Clearly sharing Supercell’s success with the entire company is something that has been important to the founding partners. When part of the company was sold in 2013 during the second investment round, the management decided to allow both investors and employees to sell off an equal percentage of stock. “I don’t know of another case like this. Usually it’s only the founding partners who sell their stock”, Petteri Koponen, angel investor and chairman of Supercell’s board, has said in an interview with Helsingin Sanomat. This move, made before the Japan deal was done, helped stave off any potential internal issues that might have threatened the company culture. And of course it was also intended to reward the people whose hard work contributed to the company’s success. And if all this wasn’t enough, the folks at Supercell have also done an amazing job of quelling the Finnish national tendency toward envy. Founding partners Ilkka Paananen and Mikko Kodisoja have said they’re thinking about setting up a foundation. And Paananen has said the company gladly paid around €260 million in corporate and income taxes in 2013 alone. And what’s more, Paananen has said he plans to use some of the €160 million he made in the deal to invest in startups. Last December Supercell employees donated €3.4 million to the building fund for Helsinki’s new children’s hospital. It’s hard to say how much the company’s good- doing has impacted its amazing results, but it has definitely had an effect on how the company is seen by most Finns. You’d be hard-pressed to find anyone with anything bad to say about Supercell. And besides, Supercell works harder than most to recruit the best people out there. When the best young game developers in the business set out to find their dream job, one company will stand out as a generous employer that gives every member of every team the freedom to pursue his or her own creative vision. You and a few friends get together to set up a company. Is that what really happened, Ilkka Paananen? ”It’s always interesting to see how outsiders see our success. For us it all comes down to one very simple idea, which was presented on the first slide in both of our first two pitches: The best people make the best games. We wanted to build a new kind of company with talent and people at the core. That’s much more important than financial goals, or any- thing else for that matter. We use a professional sports team model. No one knows better what a great game is than the people who actually make them. They don’t need anyone telling them what to do. That said, the Supercell story definitely hasn’t been all sunshine from day one. The first 18 months were tough. We had a lot of money invested in the company and everyone was wondering why because at that point we still had nothing to show for it. One lesson that wasn’t included in the piece is that our focus isn’t on what we’re doing, it’s on what we’re not doing. That’s something we’ve always been pretty good at, and we get better at it every day. We’ve also had to make other difficult decisions than the one to kill Gunshine. We’ve killed lots of products. And if a member of one of our teams isn’t working, he or she isn’t going to be on that team for very long. We’ve had a surprisingly high employee turnover. The trial period is really a trial period, and we’ve had to make some really hard decisions because we’re so paranoid about keeping our teams and culture strong. We’re also still a really small company com- pared to our main competitors. Sweden’s King has a little under a thousand employees. Rovio has over 800 employees. One of our main goals has been to keep the company as small as possible. Actually, our tablet-first strategy was the result of a trip a bunch of us took to London to meet with investors and the Facebook team there. After that trip it was clear to all of us that we had to make a big adjustment. We got all the game teams together when we got back to Finland and we had a really honest talk about it. We all agreed that we had to make some big changes. We didn’t just have to kill Gunshine, we also had a great beta- ready Facebook game that we had to kill, too. The most unbelievable part is that it was the team that had created that game that eventually made Clash of Clans. This article talks about timing, and it’s true that it’s incredibly important. No one has a crystal ball, so timing really mostly comes down to luck. Most business leaders don’t want to admit that, but it’s true. We were unbelievably lucky when it comes to timing. We don’t make games like the gaming industry analyst you interviewed described. Good games aren’t made with metrics, they’re made with intuition. Making games is an art, not a science. Metrics do show you how well a game has done, but you can’t make good games based on data. We had almost no metrics when we launched the Clash of Clans beta in Canada because they weren’t really ready to use back then. Game Executive is a unique education program tailored to the needs of growth companies in the gaming sector. It will prepare future leaders in the sector to better lead and manage their companies and create hit products from global commercialization. Currently reading: Aalto Leaders' Insight: That's super! Best practice: What can we learn from Supercell’s success?